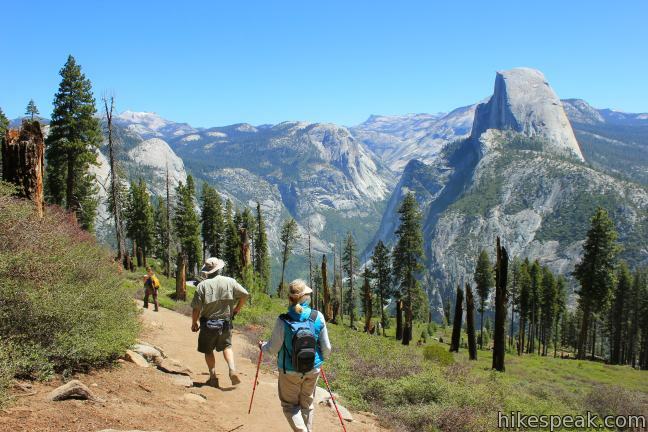 Panorama Trail is a nearly 10-mile long point-to-point hike from the top to the bottom of Yosemite Valley. 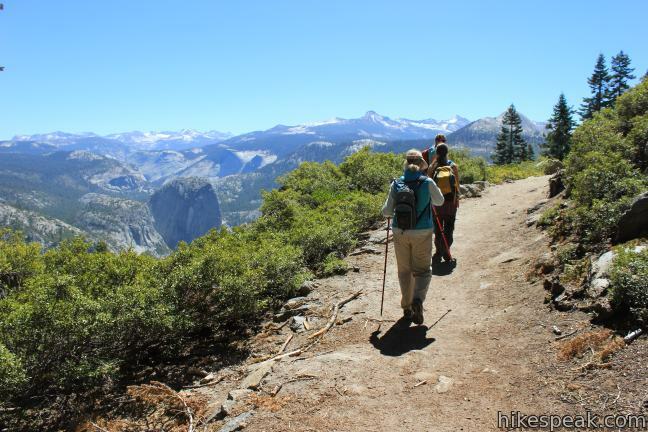 Starting at Glacier Point and ending at Happy Isles, the trail descends 3,200 feet and is filled with sensational views. 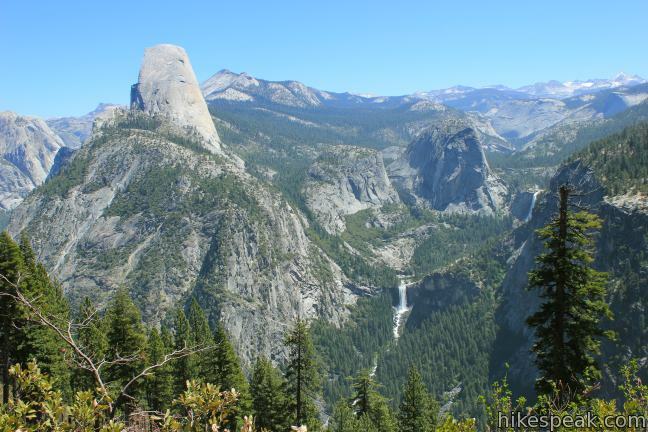 You could not pick a more panoramic start for Panorama Trail than Glacier Point, a spectacular drive-up overlook atop the south wall of Yosemite Valley. 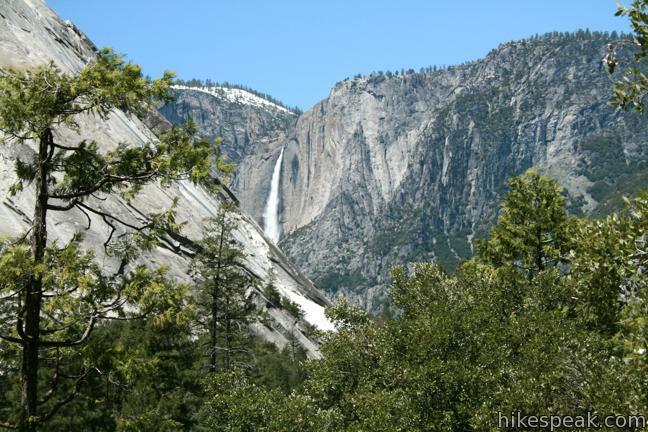 The trail descends past Illilouette Falls on a course with stop-you-in-your-tracks views of Half Dome at nearly every turn. 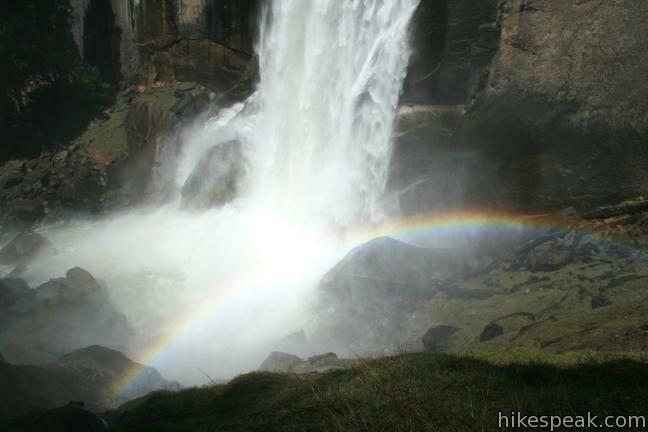 The bottom of the hike follows the Mist Trail alongside two daunting waterfalls, Nevada Fall and Vernal Fall, making Panorama Trail one of the most impressive hikes in Yosemite National Park. 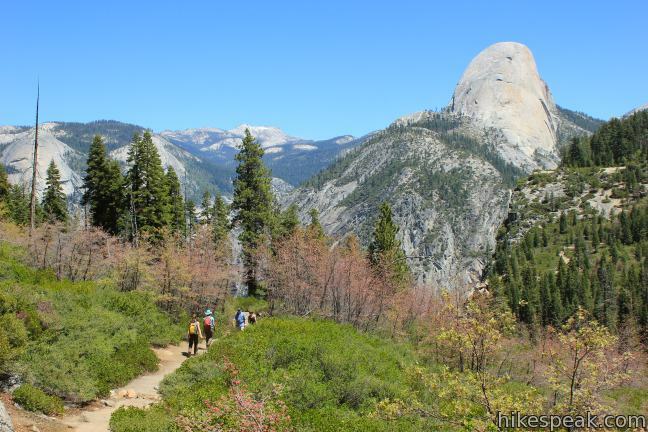 Panorama Trail is typically tackled as a one-way hike from Glacier Point down to the valley floor, dropping 3,200 feet along the way (those glutton for punishment can climb the trail in the opposite direction). 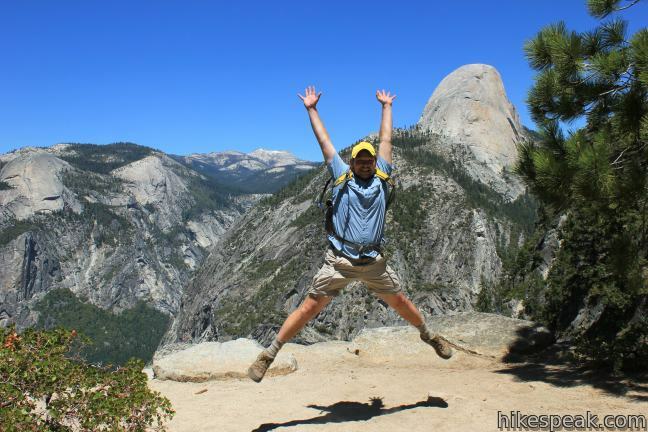 To facilitate the through hike, get a one-way ticket on the Yosemite Lodge Tour Bus from Yosemite Valley to Glacier Point. 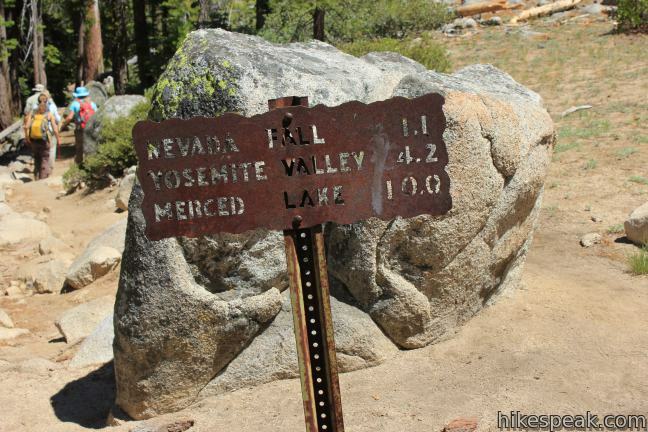 While park signs show the length of the hike as 8 miles, the actual distance is around 9.4 miles. 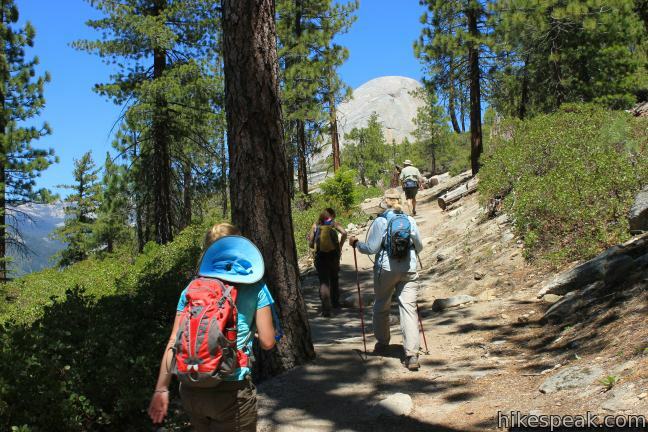 Carry plenty of water and plan for a long day hike. 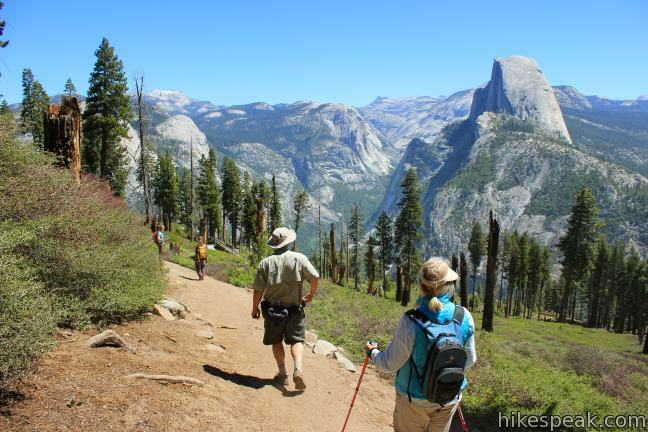 Because you are starting from Glacier Point, which offers one of the best vistas in the park, be sure to survey Yosemite Valley and all the surrounding domes, peaks, and waterfalls, before heading down the trail. 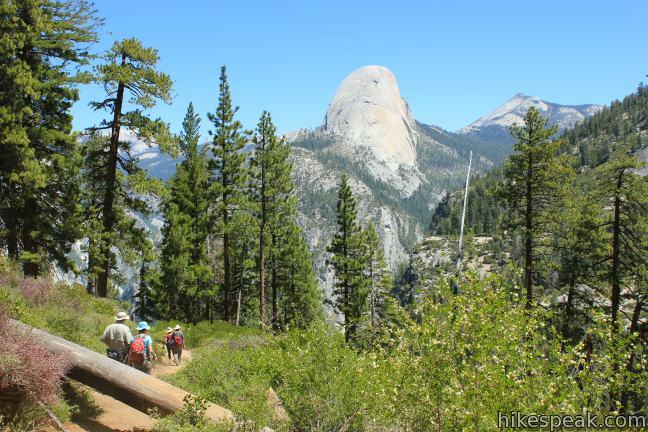 Find a large wooden sign for Panorama Trail at the south end of Glacier Point not far from the parking area. The single-track trail heads briefly uphill before commencing a gradual southward descent away from the 7,200-foot overlook. The cushiony dirt trail plots an easy course along the east side of Illilouette Ridge toward a hanging valley carved by Illilouette Creek. Oaks and pines provide occasional shade while you enjoy the kinds of views you would expect to find on a trail named Panorama. 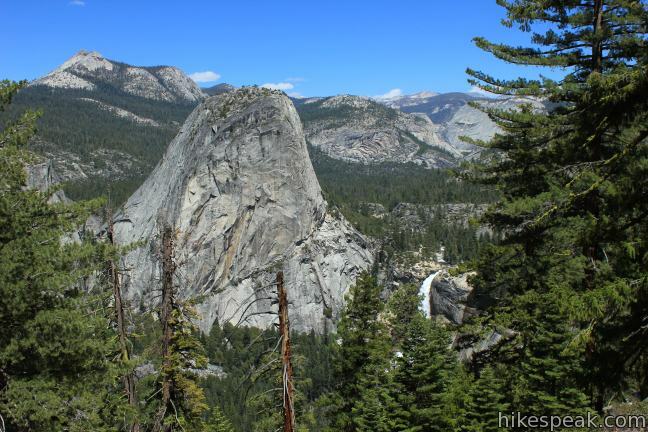 Right from the very start, Panorama Trail delivers vast eastward views toward Half Dome, Liberty Cap, Vernal Fall, and Nevada Fall. 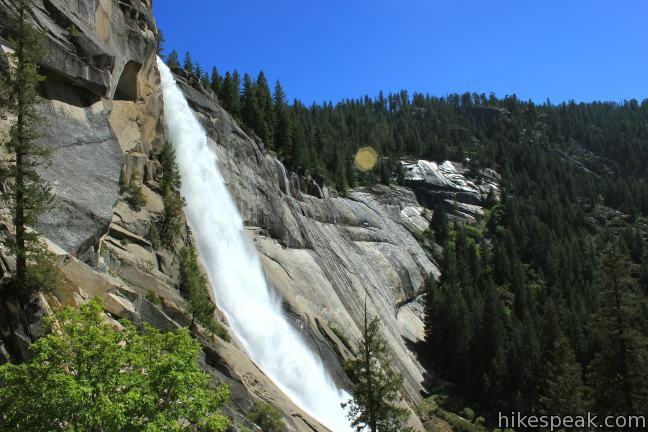 The waterfalls are exciting to see, especially knowing that you will be hiking in their splash zone in just a few hours. 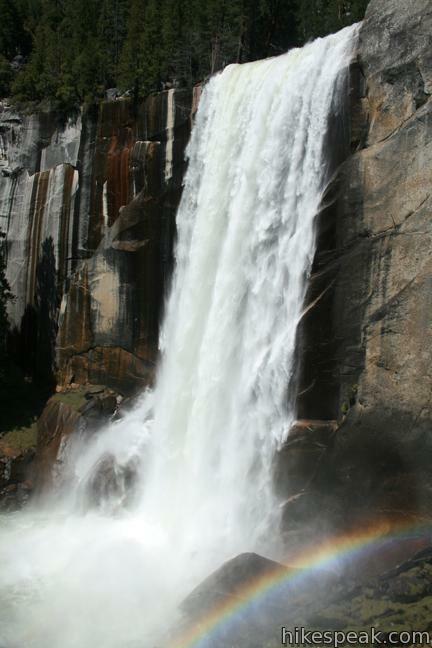 A mile from Glacier Point, the top of Illilouette Falls appears, diving off a granite cliff. 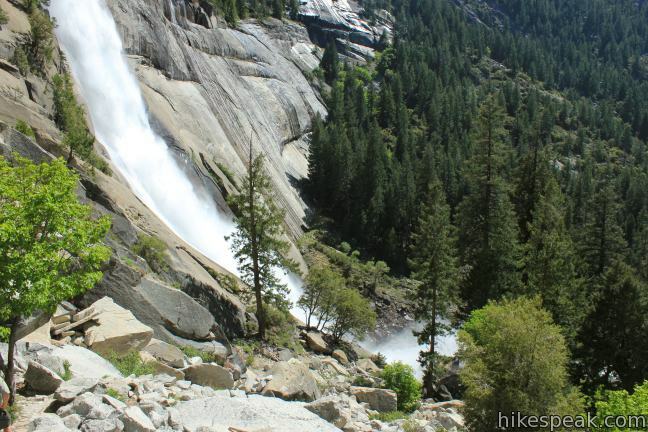 At 1.75 miles from the start, turn left at a marked junction to continue down Panorama Trail toward Illilouette Falls, passing Buena Vista Trail. 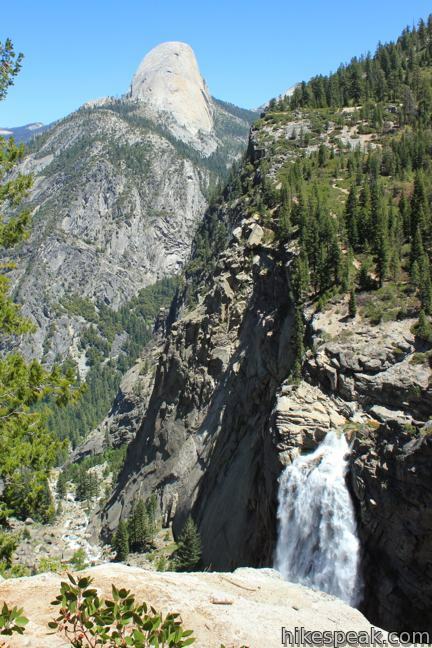 Half a mile past the junction, Panorama Trail crosses a perch atop the sheer canyon wall facing Illilouette Falls. 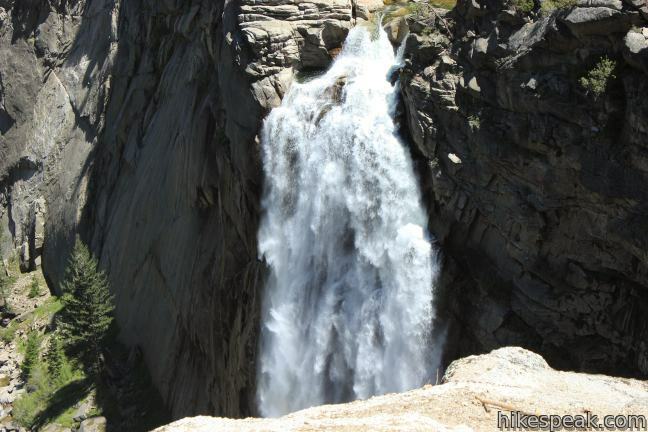 This is the hike’s best view of the waterfall as it plunges over the edge, making a thunderous 370-foot free-fall into the side canyon below. 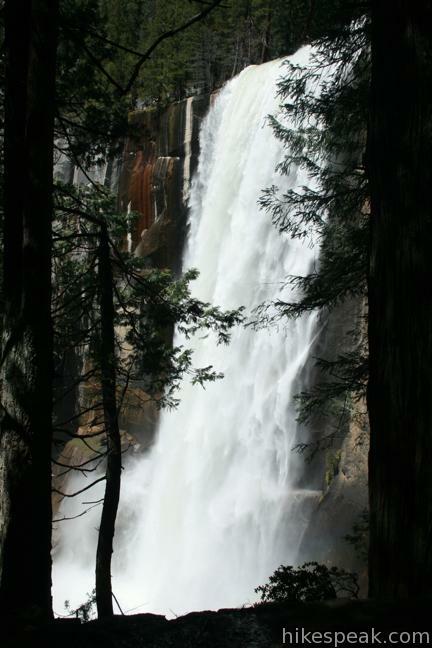 The perspective of Illilouette Falls is mesmerizing. Just don’t step too close to the edge. Panorama Trail continues downhill through a pine forest toward Illilouette Creek just above the waterfall. After dropping 1,300 feet in 2 2/3 miles, the trail crosses a footbridge over the creek and turns uphill. 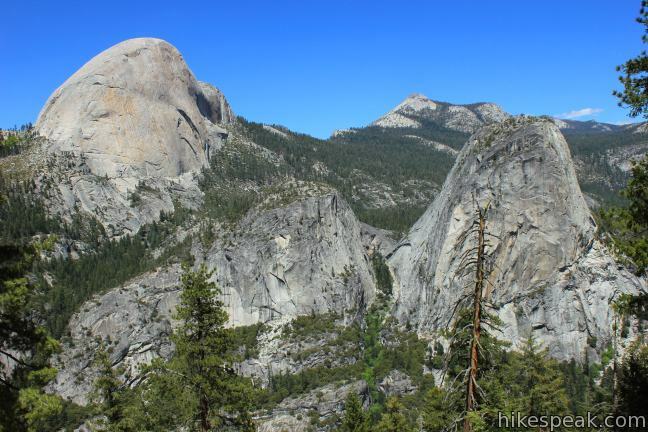 As you climb the opposite bank, you can peak off the edge of Panorama Cliff across Yosemite Valley toward North Dome and the Royal Arches on the opposing granite wall. 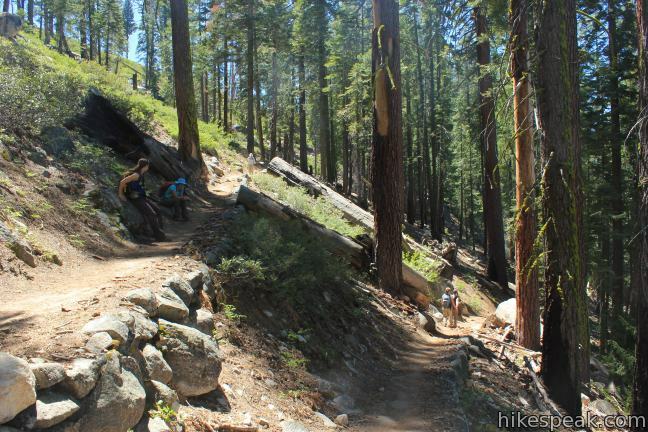 The trail launches into a string of switchbacks that break up this mostly downhill hike. Keep an eye out for a spur trail veering off to the left, just under 2/3 of a mile from the creek. 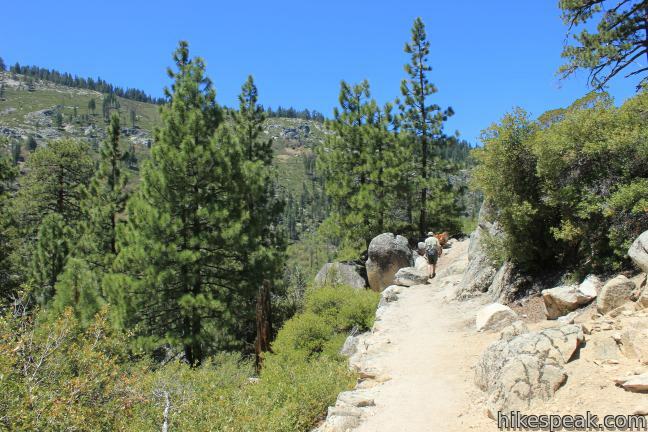 The spur trail is unmarked, but leads to an impressive vista point on Panorama Cliff, so you do not want to miss it. 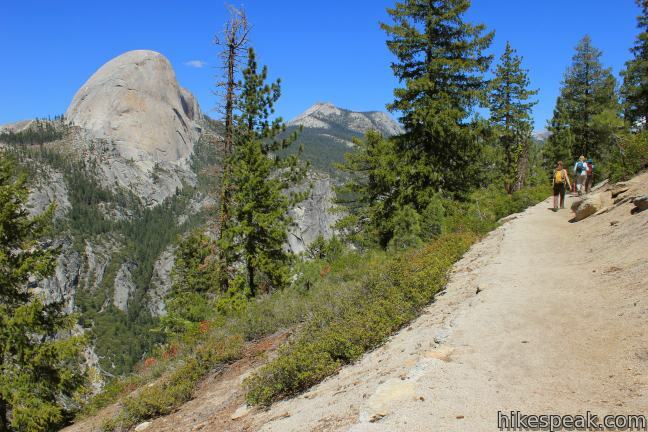 After a compact line of switchbacks, the trail makes an extended run to the right (south), before routing back toward Yosemite Valley. When the trail curves to the right, heading east, break off the trail and continue straight north. 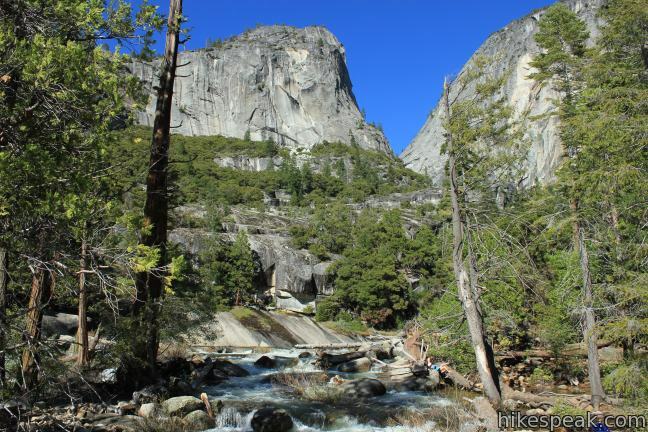 If you miss the junction, you will begin hiking east toward a jumbled rock pile that is visible above the trees. Take the path for a tenth of a mile, passing through waist-high manzanitas to a landing on Panorama Cliff. 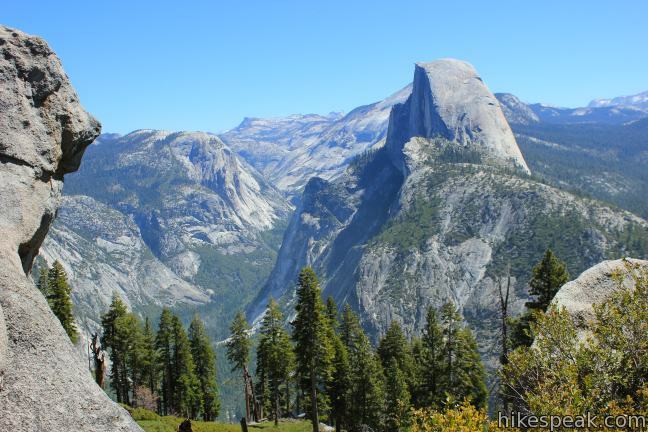 Half Dome, North Dome, Royal Arches, and Glacier Point are all in sight. 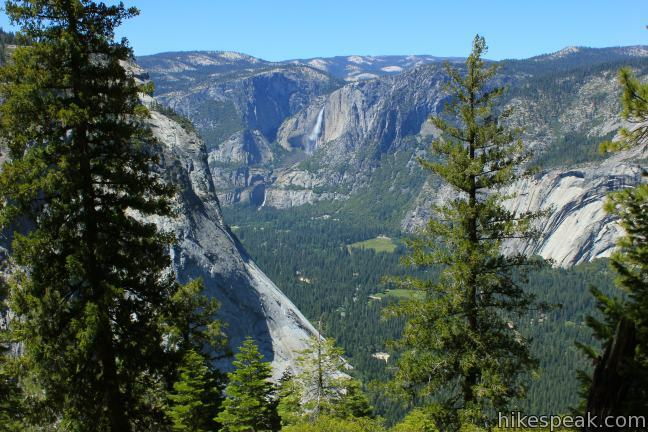 This may be the broadest possible view of Yosemite Valley that does not include one of its marquee waterfalls (but plenty more waterfalls are visible just up the trail). 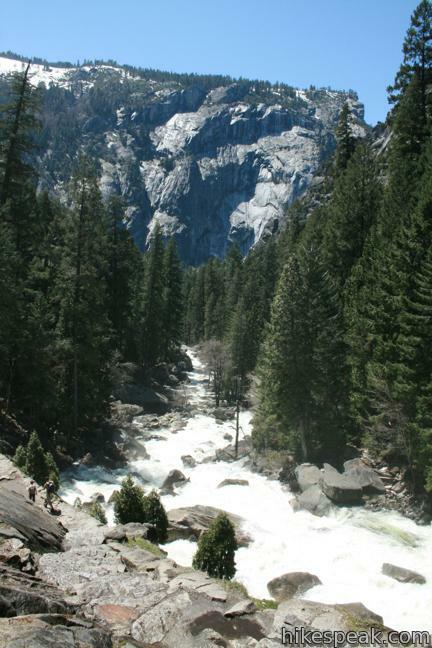 The cliff soars above the confluence of Illilouette Creek and the Merced River. Take a break from hiking and enjoy the view. Backtrack to Panorama Trail, which continues east, maintaining an uphill course for another 3/4 of a mile before cresting and heading back downhill. 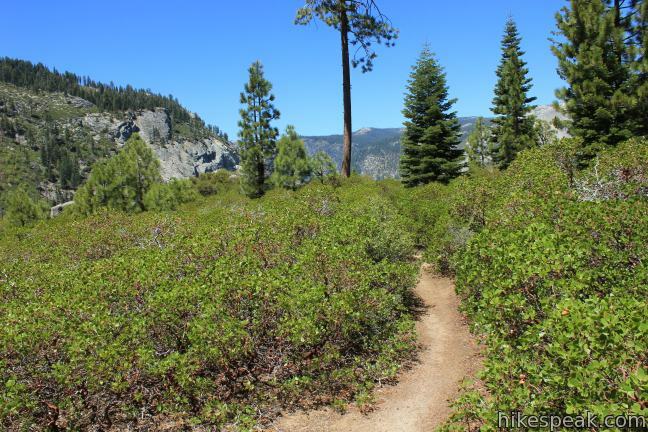 There is 750 feet of elevation gain between Illilouette Creek and this rise in the trail. 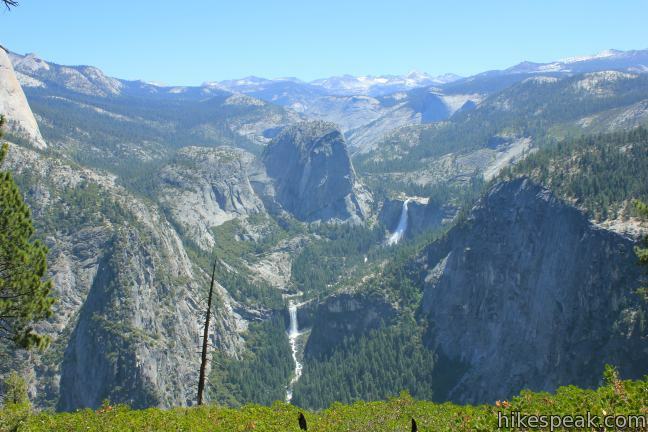 To keep you motivated, gaze across Yosemite Valley toward Yosemite Falls, the tallest waterfall in North America. 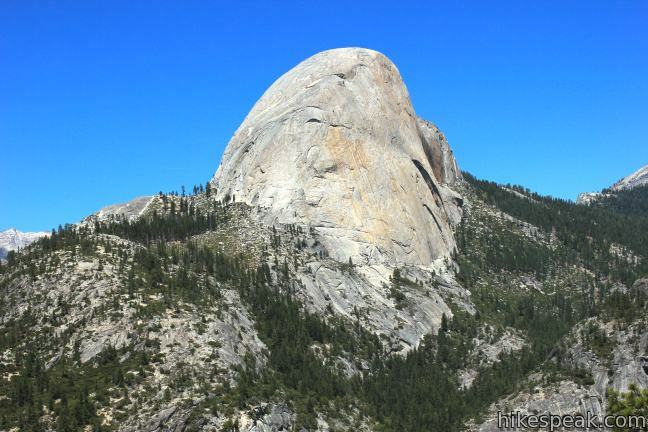 And like a carrot on a string, the looming granite mass of Half Dome ofter hovers directly in front of the trail. 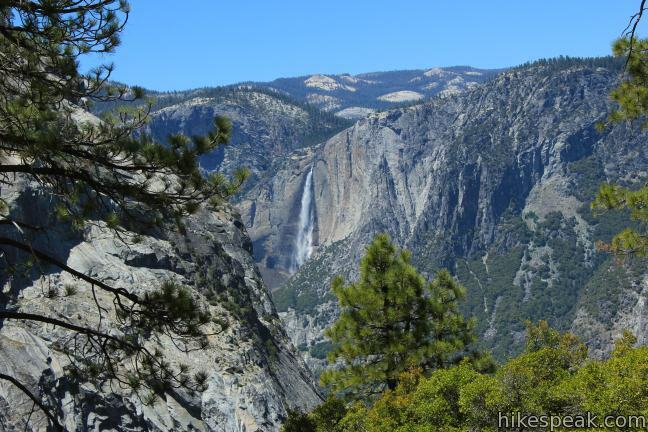 Liberty Cap and the top of Nevada Fall come into view after another quarter mile. The trail travels downhill through a forest of tall peaceful pines, many of which are covered in yellowish green wolf lichens. Stay straight through a junction with a trail to Ottoway Lakes, and meander down long switchbacks that overlap seasonal streams. 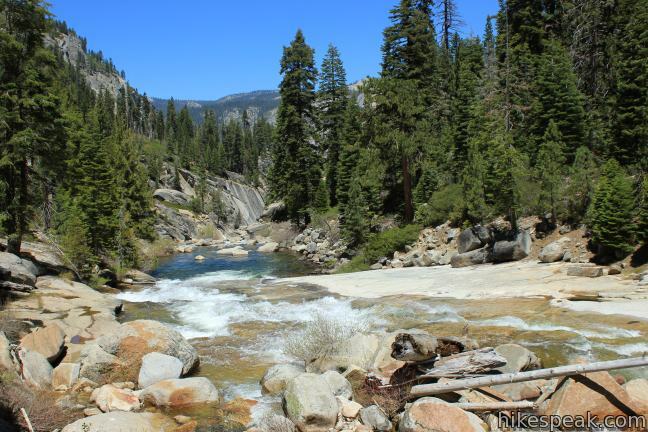 Panorama Trail comes to a T-junction with John Muir Trail, 3.35 miles from Illilouette Creek. 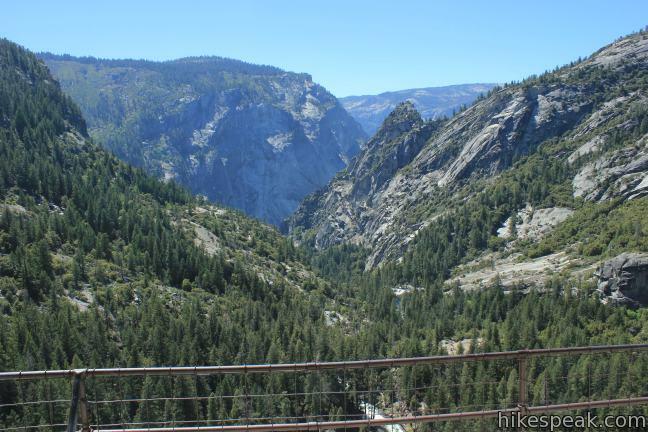 If you prefer a more gradual but less dramatic hike down to Yosemite Valley, turn left. 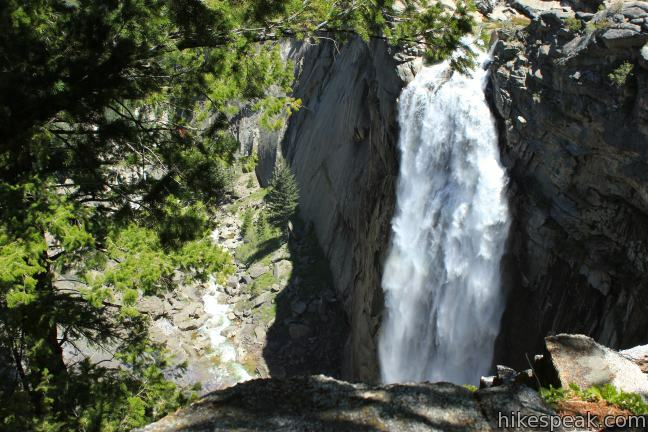 Otherwise, to hike down the Mist Trail, turn right and hike a quarter mile to the brink of Nevada Fall. Cross over the Merced River on a footbridge just above the waterfall. On the other side, you may make a detour to the left down to an overlook just below the top of the waterfall, which drops nearly 600 feet into the canyon below. 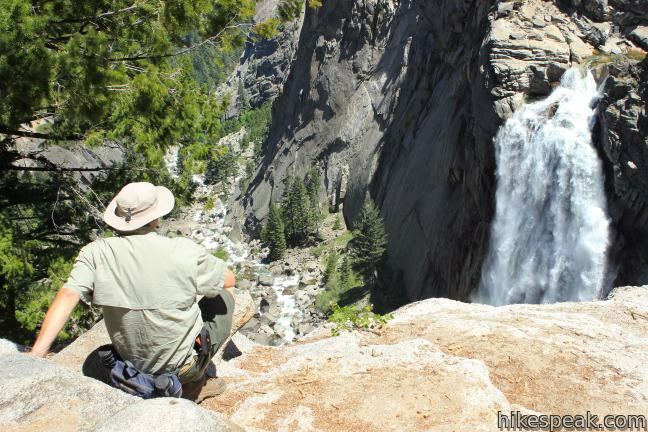 Enjoy the view from the top of Nevada Fall, and hike another quarter mile to a junction with the top of the Mist Trail. A bathroom marks the spot. 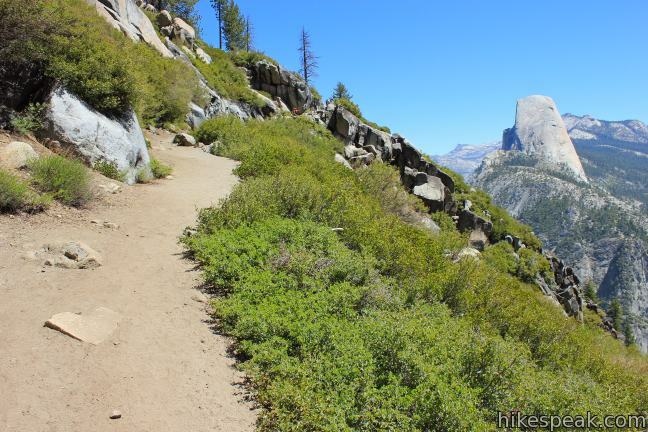 The trail to Half Dome continues straight ahead, but turn left to hike the final three miles down the Mist Trail to Yosemite Valley. 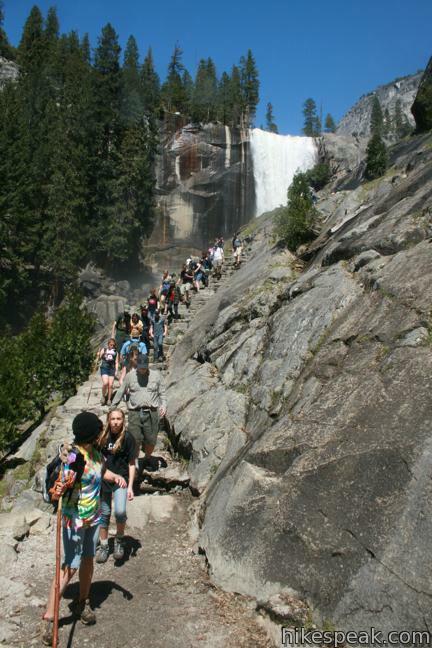 Hiking down the stone steps along the Mist Trail can be taxing on tired legs, so take your time. 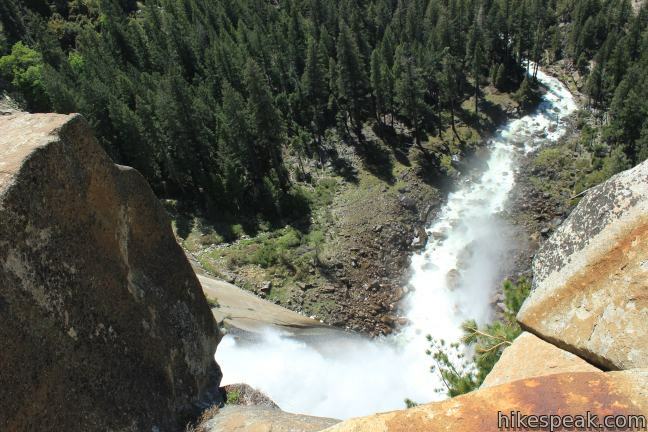 The descent is steep, but delivers good head-on views of Nevada Fall. 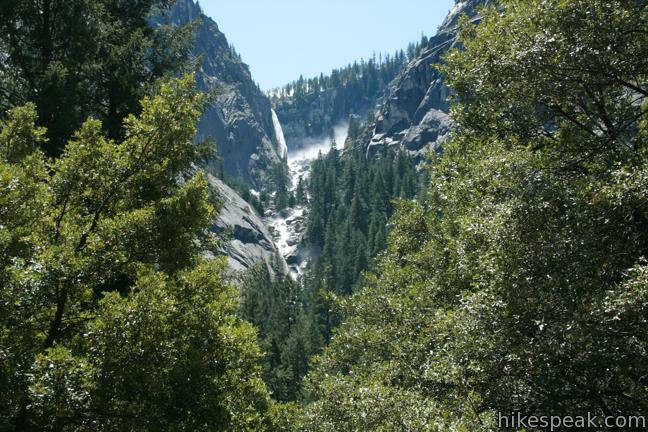 Below the waterfall, the trail passes through a surprisingly dense forest of relaxation-providing pines. 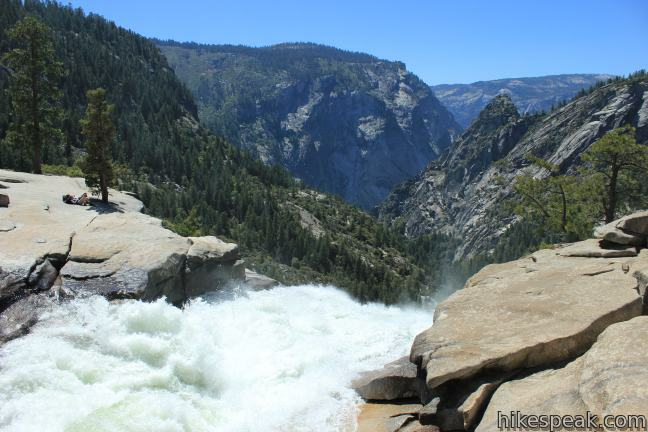 Proceed across a footbridge just above Emerald Pool and follow the Merced River to the top of Vernal Fall. Look over the waterfall from a fenced-in overlook at the brink. 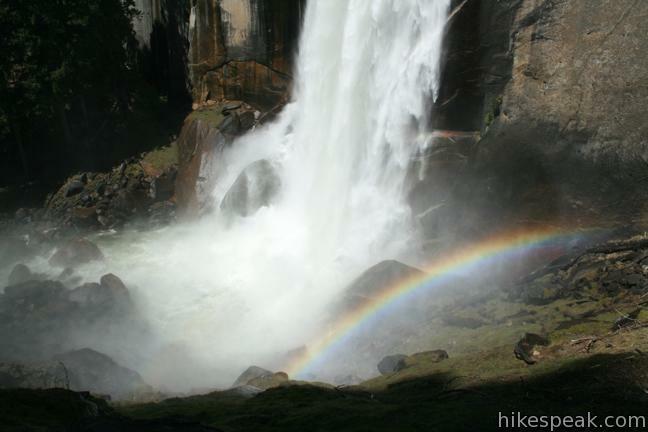 From Vernal Fall, there are just 1.65 miles to go, and the next stretch of the Mist Trail is as exciting as anything that has come so far. Descend stone steps on an invigorating path to the base of Vernal Fall. Prepare for a shower of waterfall spray along the way. 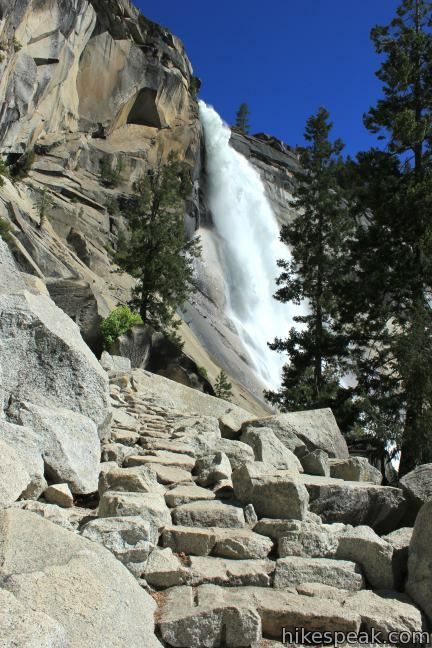 Below the steps, the Mist Trail joins the other end of John Muir Trail and continues to a footbridge below Vernal Fall. Another bathroom is located here, along with a water fountain. 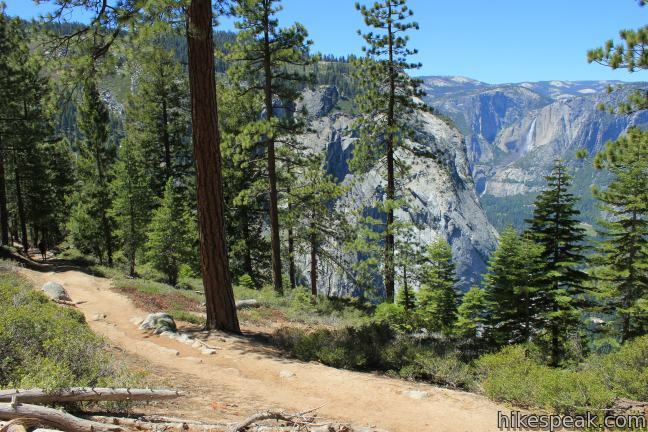 The trail is paved for the final 0.9 miles down to Yosemite Valley. 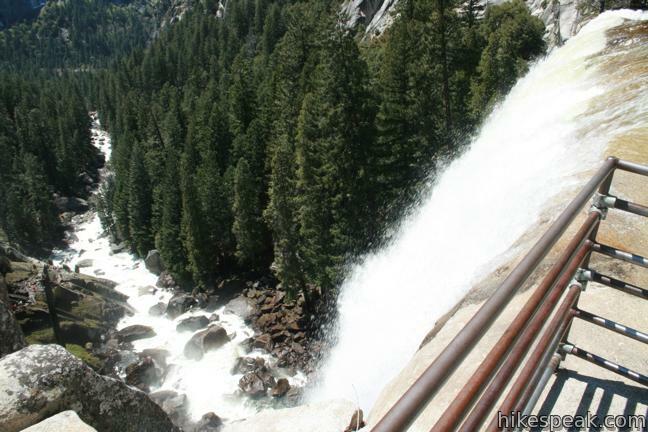 There is some extra uphill after crossing the footbridge, rewarded by a view of Illilouette Falls, now from the bottom up. 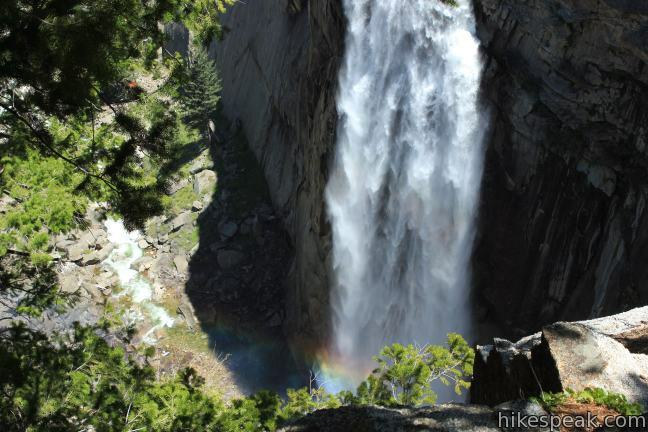 Yosemite Falls makes a final appearance before you reach the bottom of the trail. 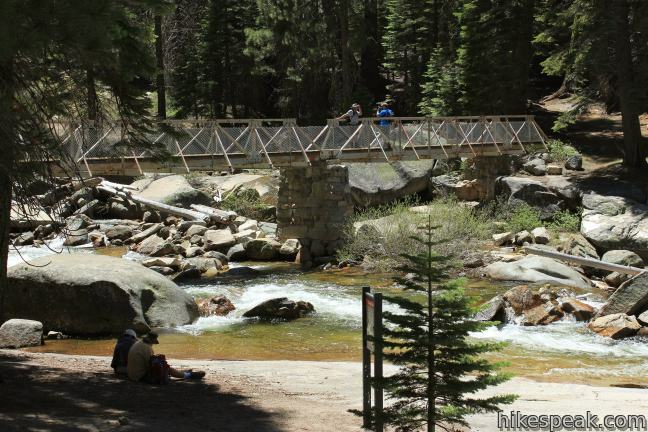 Turn left across one last bridge over the Merced River to reach the Happy Isles Shuttle Stop. 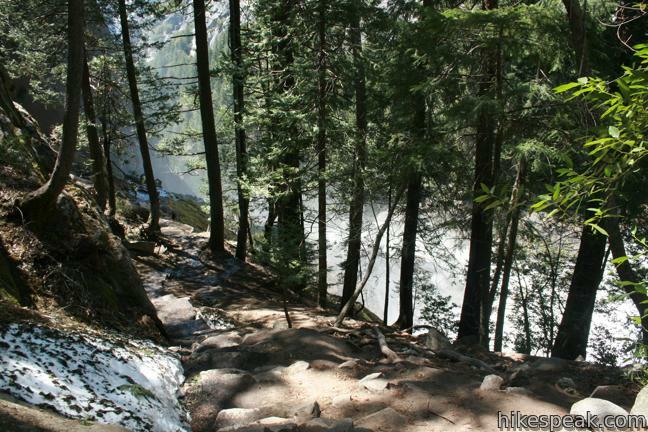 (This is the start of the short, easy trail to the Happys Isles in the Merced River.) 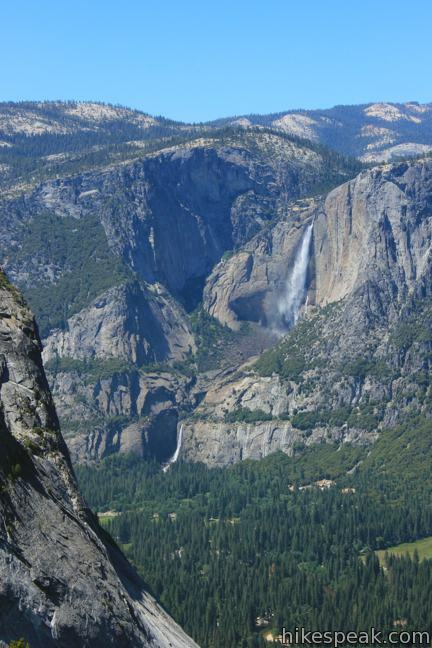 Take the free park shuttle back to the Yosemite Lodge or another destination in Yosemite Valley. 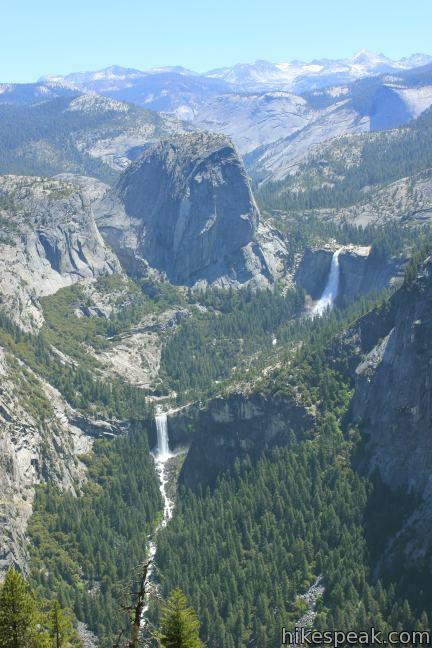 The bus from Yosemite Lodge to Glacier Point departs daily at 8:30 a.m., 10 a.m., and 1:30 p.m. One-way tickets are $25 for adults. 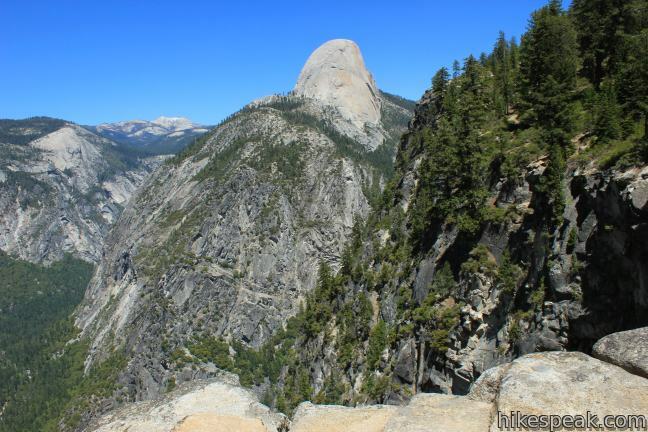 The ride to Glacier Point lasts about 90 minutes. The tour bus driver will narrate the ride with information about the park. Make a reservation at the activities desk inside the hotel or by calling (209) 372-4386. 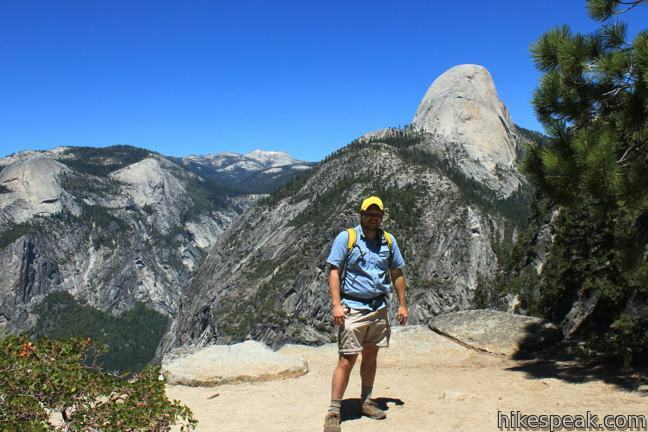 No permit is required to hike Panorama Trail, but Yosemite National Park has an entrance fee. 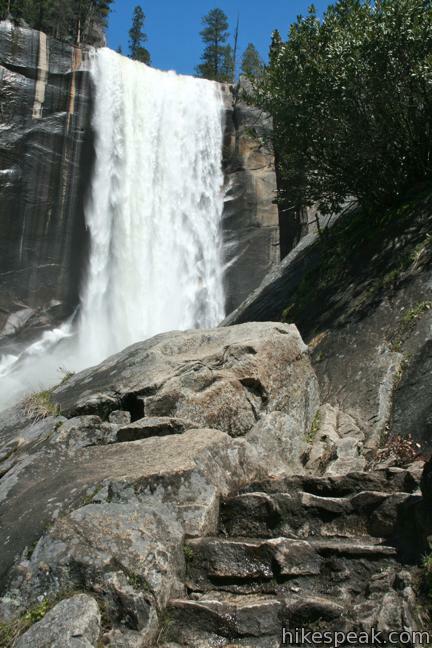 Due to changes in concessions at Yosemite National Park the times and prices for the shuttle may have changed. Confirm your plans in advance. To get to Glacier Point: The road to Glacier Point (called Glacier Point Road) is located ten miles south of Yosemite Valley off Highway 41. 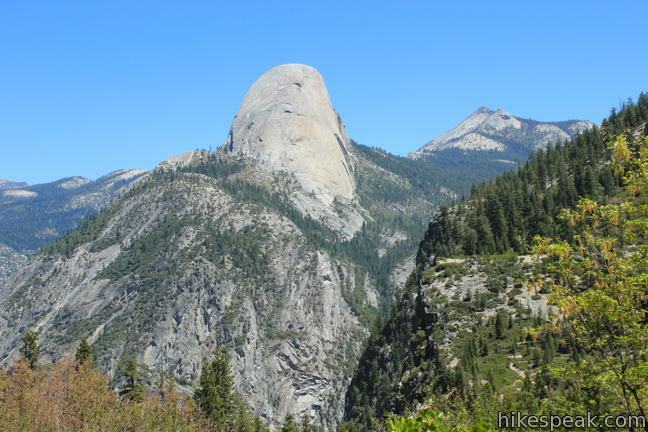 The road to Glacier Point is also seventeen miles from the south entrance. 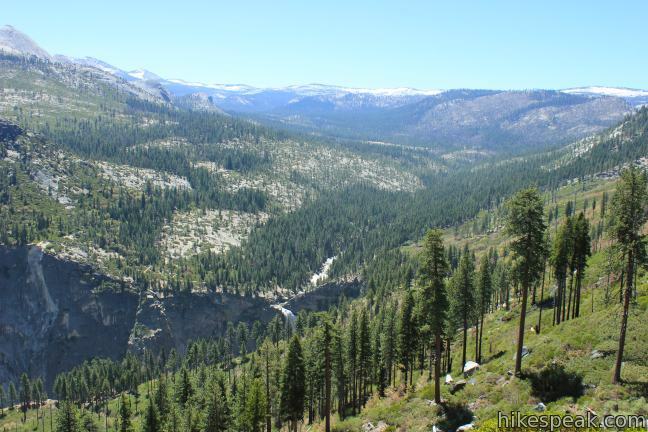 Turn east on Glacier Point Road and drive fifteen miles to the parking area at the end of the road. 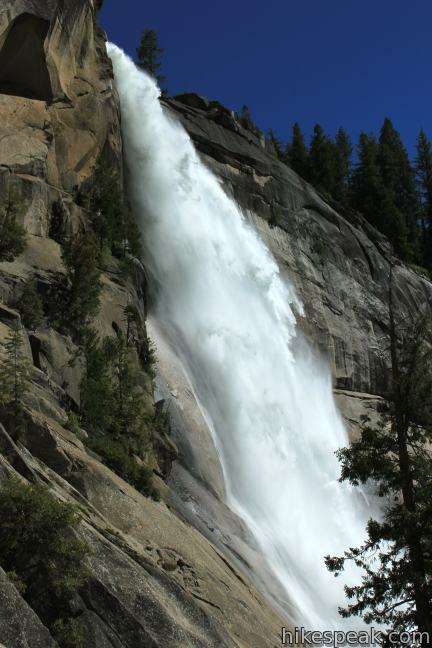 To get to Yosemite Lodge at the Falls: Take Northside Drive west of Yosemite Village just past the trailhead for Lower Yosemite Falls Trail. Turn right on Yosemite Lodge Drive to reach the hotel entrance. These photos were taken in May of 2011 and 2012. Click to enlarge. 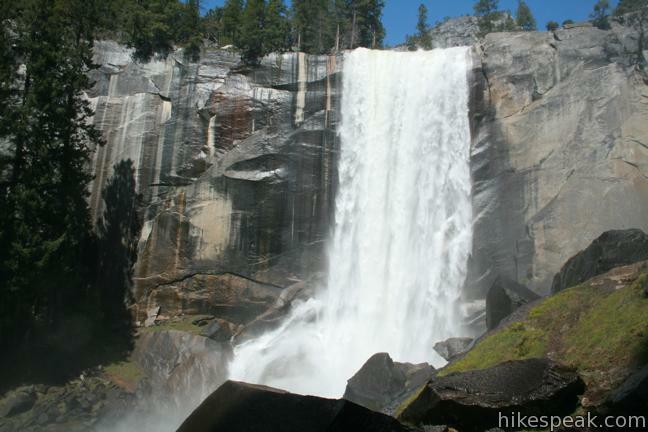 This 1.8 to 6.1-mile hike takes an exciting course past Vernal Fall and Nevada Fall, two of Yosemite's prize waterfalls. 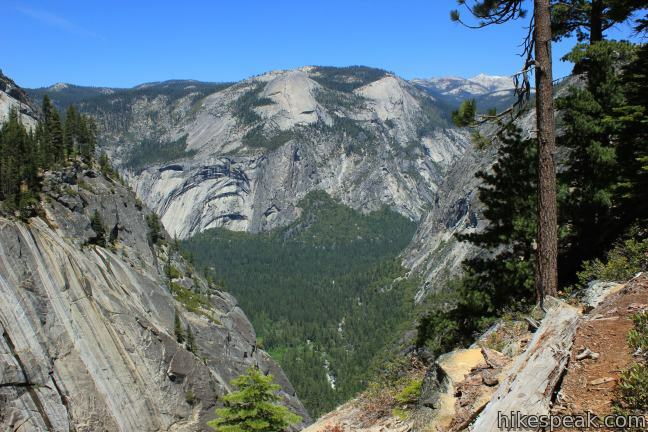 This 2-mile round trip hike visits an overlook on the south wall of Yosemite Valley with fascinating rock fissures carved into the exposed granite. There are 13 campgrounds with over 1,600 total sites spread throughout the park to facilitate your visit. 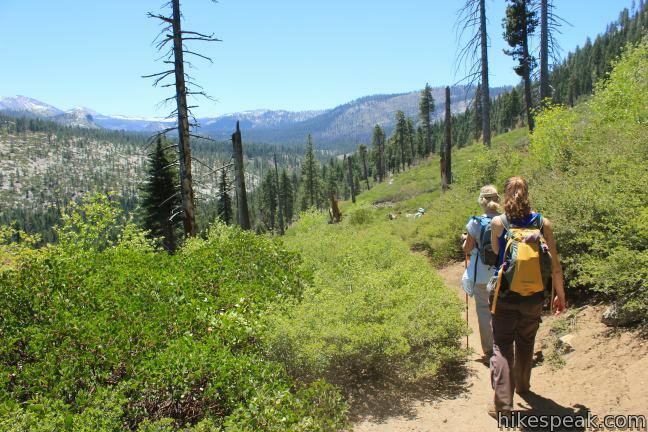 The Panorama Trail is easily one of our favorites! It boasts incredible views, is largely downhill and nothing is as rewarding as having to complete the entire distance~ no excuses on this one. 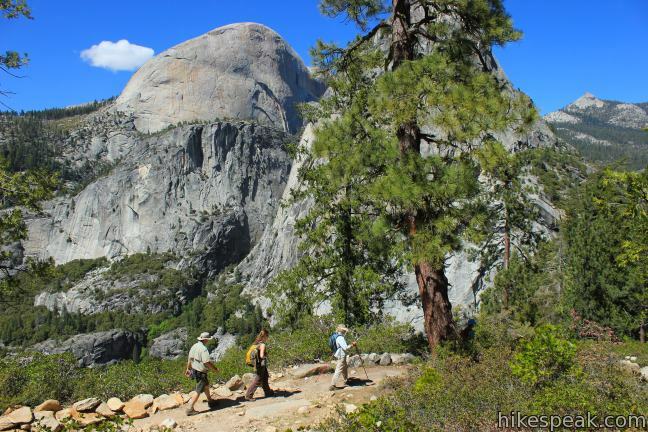 If you are interested in hiking up to Glacier Point instead of taking the shuttle, we suggest the Four-Mile Trail from the Valley floor. 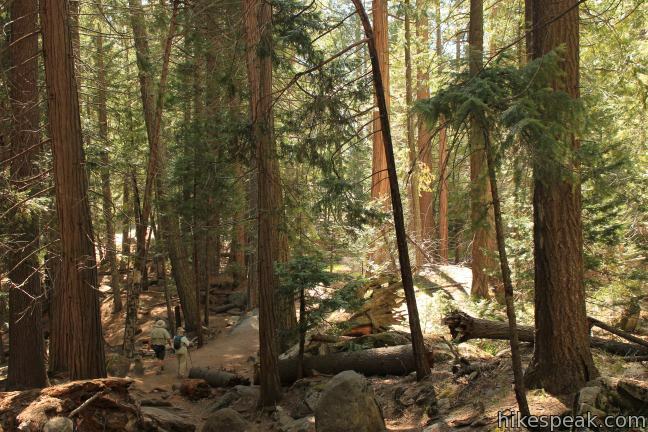 It adds some climbing and distance, so don’t attempt it if you were already weary of the 10 mile Panorama Trail! 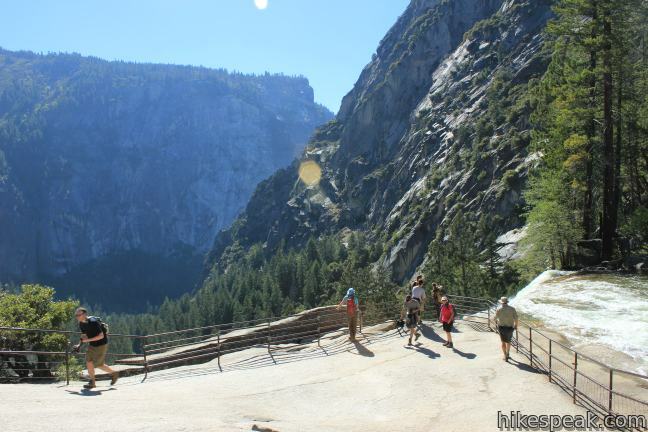 If you park at Glacier Point to start the hike and the hike ends at Happy Isles, how do you get back to your car? Seems the free shuttle from Happy Isles only goes to Yosemite Lodge? Thank you ahead of time for any information that would be helpful!! 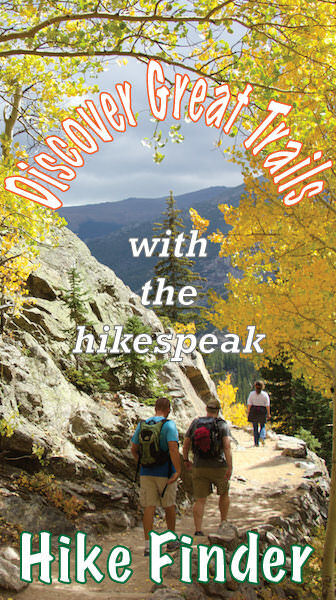 Has anyone tried this hike with a stroller or carrying a child (harness or baby carrier backpack)? I WOULD not recommend this hike with a stroller. IT is rocky in places and the trail is not friendly to strollers. If you have the ability to carry a baby for 10 miles over uneven terrain and have sun protection and your baby is OK with staying in a pack…you make the decision. I’m trying to plan a trip using this trail. I want to get a wilderness permit and camp at the end. This is what their website says: Camping is not allowed on the Panorama Trail or near Illilouette Fall. 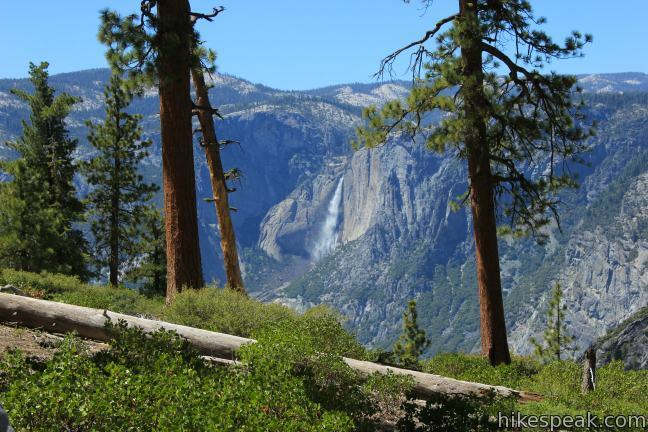 You may hike along the trail and camp at another destination beyond. WHERE WOULD I NEED TO SECURE MY PERMIT TO DO THE TRAIL ABOVE? THANK YOU!!!!!! When is this trail usually free of snow and able to hike? We are planning a trip in late May.